Dolly's Legacy Animal Rescue : Adopt : Rehoming Your Pet : Do You Need To Rehome Your Current Pet? We get multiple requests every day to save pets who are in shelters or in need of a new home due to other circumstances. Our foster homes remain at full capacity. There are simply too many sitting on death row in shelters waiting for their chance to be saved, and not enough adopters or people who are willing to make room in their lives to take them in. We can only help as many as we have the foster space & resources for, and our primary mission is to save those in shelters who have been abandoned or orphaned. Shelters, even those local to us, are completely overburdened with pets and thousands end up being euthanized due to lack of space. Please do whatever you need to do to keep your pet with you. Surrendering a pet to a shelter is incredibly stressful and frightening, and there is no guarantee they will make it out alive. They will be surrounded by hundreds of other pets who are crying, shaking, and barking, wondering where their families are. You are your pets' family, please don't break the promise of forever to them. If you are absolutely out of options and have no other choice but to find a new place for your pet, we would like to refer you to 'Rehome'. It is an amazing new tool designed through the Petco Foundation to help pets go from their current home directly to their new adopter without ever entering a shelter, placing additional burden on a rescue, or ending up in dangerous hands via a classified site. 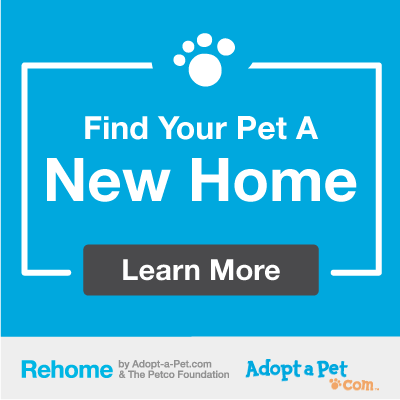 It guides individuals who are rehoming a pet and gets their pet seen by thousands of potential adopters on Adopt-a-Pet.com. Please visit the link above and they will guide you through the process of finding a new home. We hope your pet gets the happily-ever-after that every pet deserves.